We all know that being physically active is incredibly important for children, and thankfully most kids love to be involved in sports. Some children gravitate towards group sporting activities, while others prefer more independent types of sports such as skating and martial arts. Whatever your children's interests are, there is plenty of choice to keep them active over the summer. Children between the age of four and seven are just starting to decide for themselves what types of sports they prefer. With this in mind, some parents believe that children of this age are too young for organised sports, where the emphasis often is on competition and winning. Children in the early years should play sport simply for the love and fun of the game, they say, and concentrate on learning team skills and sportsmanship. There is ample time for them to hone their sporting capabilities later, when they are better able to make sense of the game. If you do want your child to play on a team, make sure the emphasis is learning how to play and having a good time, not winning and being the best. Nothing can put an individual off sports than a bad experience at an early age, whether it's too much competition or feeling that they're not good enough to make the grade. An enormous array of team sports are available for children as young as four. Both boys and girls should be encouraged to participate. Football. Look around to see what type of coaching is available for your children's age group. Or you may just want to take them to kick a football around your local park! Hockey. If you can find it in your area, go for it. Cricket. Round up a group of neighbourhood children for a game at the park. Basketball. If you can find a gym with a hoop, you're in luck. Otherwise, you can always improvise and make one of your own. Volleyball. Many indoor gyms offer volleyball classes for young kids. Swimming. 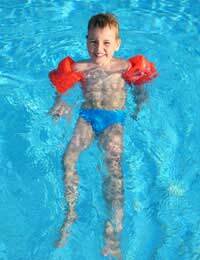 Most swimming classes take children from aged four on their own. This is a life survival skill, not just a way to have a good time in the water - although that is important as well. Gymnastics. Boys and girls love gymnastics, which encourage children to be flexible as well as fit. A variety of tumbling classes are on offer, from beginning to advanced. Martial Arts. Many different types of martial arts are available for kids from any age, including karate and tae kwan-do. Tennis/Badminton. Some children love tennis, others find it too difficult. Start early and find out. When they're a bit older, they can take up squash. Not all kids gravitate naturally to sports, so letting them watch a professional game could help pique their interest. You may have already taken your son to several football games, why not now take your daughter, or whisk them both off to see a martial arts demonstration? When children see grown-ups doing what they love on a professional level, it can encourage them to be more involved themselves. And if they find it really boring, at least you know you won't have to spring for tickets a second time!